The new coalition government continued to outline its plans for the brand new era of change sweeping the country. Having revolutionised democracy by planning to ignore it, the next step is mathematics where centuries of tradition and fact based reasoning will be swept away to appease a power obsessed minority, who can’t count. 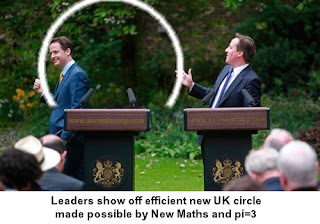 Mr Clegg’s Liberal Democrats have confirmed that the value of pi , traditionally pegged to the ratio of a circle’s circumference and its diameter, will now be standardised on the easier to use value of 3. Mr Clegg said that the new value of pi at 3 would make calculations easier and more transparent and leading to an efficiency saving as Britain’s circles would require over 4% less raw materials. Once a value of three had been accepted for pi the Liberal Democrat ruling elite members believe it would become straightforward for other mathematical principles to be re-evaluated for the good of voter. Mr Clegg has dismissed challenges over his plans for electoral reform by pointing out that all of the journalists had studied humanities and they should ask a friend who could do sums. The Prime Minister was said to be fully supportive of his deputy’s plans on both voting and numerical reform. The Prime Minister, who has been leader of the reactionary Conservative opposition party for half a decade is spearheading the New Politics in the New Era for Change. The Liberal Democrats have now fulfilled their ideal of a numerically representative democracy in Britain with their party calling the shots, despite having less than 8% of the seats. However it has become apparent that the 5 days taken over paying for Nick Clegg’s services have left insufficient time to draft the Queen’s Speech to parliament, during which Her Majesty will outline the precise manner her new government will be sending the country back to the dark ages.